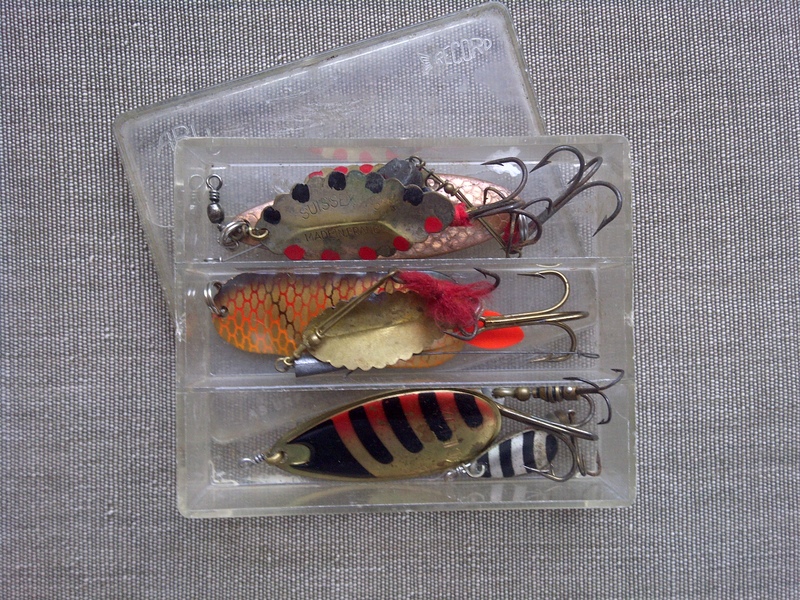 traffic lights….a set of 3 pike floats, the River Wandle in search of trout, and where is my Abu 506 along with a box of Rapala lures. Sunday started to with a dash to Carshalton to a place not far from the banks of the Wandle where the river begins. 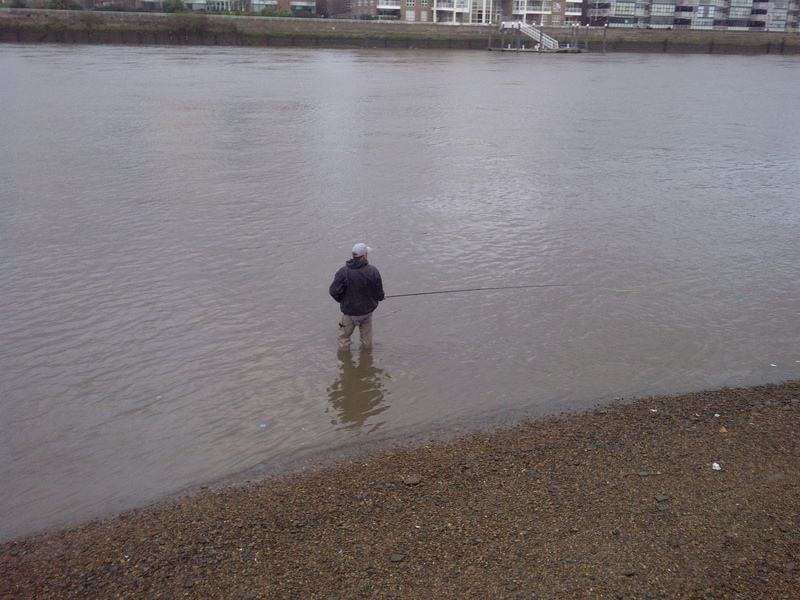 From the text of Charles Rangeley-Wilson in his book The Accidental Angler he writes about his journey across London in search of the lost rivers of the Fleet, Tyburn and the Wandle where he searches for trout, but finds small shoals of dace and chub. 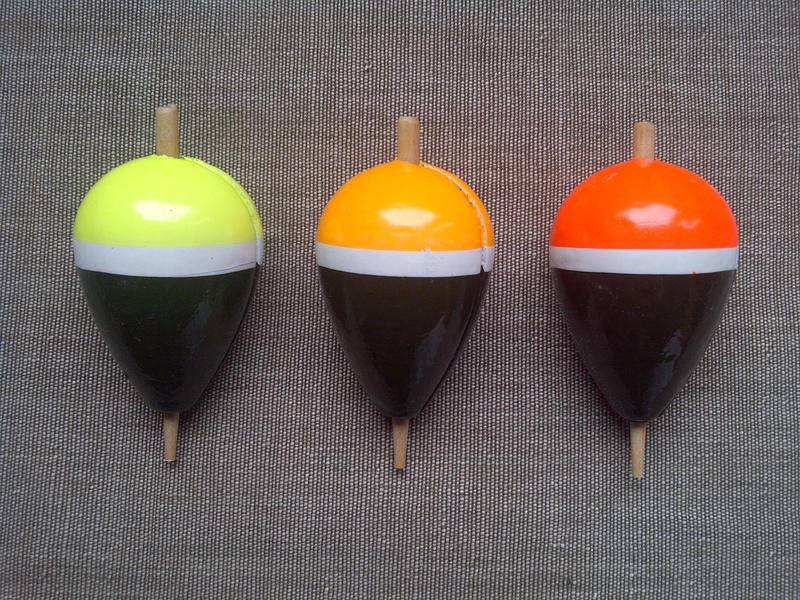 A collection of pike floats in yellow/green, orange and red, more modern than some of the vintage floats I have remind me of traffic lights. The day is turning colder as a warm front pushes the cold air from the west across the country. With small patches of blue sky my thoughts turn to the metallic blue cover of an Abu 506. I know I have one but haven’t found it since the house move nearly 8 years ago. It must be in a box in the loft with some old spinning tackle which also includes my collection of Rapala lures purchased for a fishing trip to the Tamar for salmon and sea trout. .
more bungs than a premiership manager, Abu-matic 170 and teeth of a Mahseer..
After a busy week the weekend is upon us and time to think about a bit of fishing. On Tuesday a fine collection of pike Gazette style floats came my way from North of the Border . Wednesday my Abu-matic 170 got a dusting and will be used for a spot of spinning. 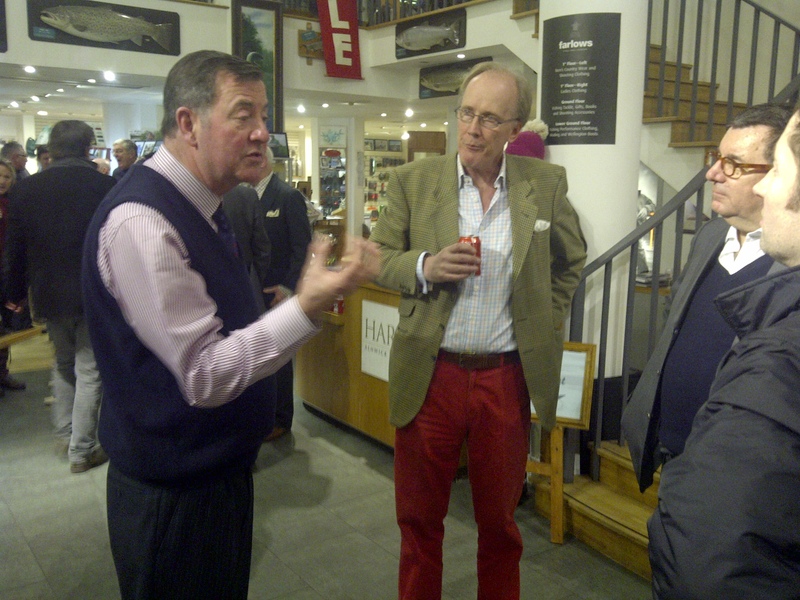 Thursday I was a guest of Farlows of Pall Mall for an evening dedicated to Mahseer fishing in Nepal hosted by Christopher Ussher and Friday evening will be sat by the fire reading a book on Pike Fishing. A rainy Tuesday….a trip to Farlows, Frontiers and Bigatmo. Thursday’s event at Farlows will be about fishing in far off destinations and one company I will aim to cover over then next few weeks is Frontiers see http://frontierstrvl.co.uk. When heading to these destinations you’ll need some good quality optical ware of which I have been given a few samples to try out from the newly released Bigatmosphere brand. See http://bigatmo.com . These high quality frames and lenses offered by Bigatmo fit well as they were designed around the needs of commercial pilots. Having been tested by pilots and professional drivers I was asked to try them for fishing….well maybe not today but I’ll give them a try on the next bright day. The frames are light and can be fitted with prescriptive lenses. The prices range from £195 upwards so you don’t want to drop these into the river. During the year I plan to review Salty Dog Game Fishing, the bass fishing specialists who operate guided tours from Chichester Harbour on the south coast,and Hotchkiss Fly Fishing who offer guided tours on premier beats of the Test, Itchen, Kennet, Avon and tributaries. Work had taken me north of the border this week so a trip on the East Coast train line through the heart of England and up along the coast via Berwick on Tweed enabled me to reflect on what a beautiful country we live in. With tended allotments, manicured gardens and picturesque pastureland along with the more rugged hillsides of Northumberland. I saw many rivers, canals and lakes. The train sped past fisherman who used their skill to tempt fish to take in the cold January waters, some fished on their own sat on banks, others spinning and a large group were clearly match fishing. I returned from Edinburgh on the night train and during the journey read ‘The Accidental Angler’ by Charles Rangeley-Wilson, published by Yellow Jersey Press. If travelling it is an ideal companion. If only I could have got to sleep on the overnight Caledonian Sleeper I could have dreamt of sitting on a riverbank in dappled sunlight watching a Harcork float bob in the gentle summer breeze until it momentarily slipped beneath the shimmering water. I have to add this was not to be as the train rattled its way from Waverley to Carlisle stopping for a few minutes before the carriage shuddered as we pulled away in the indigo coloured darkness. I have seen for myself dead brown trout, sea-trout and salmon smolts after the outfall of sewage from the recent spills into the Thames, sad as it was to witness it also gave me some faith that these majestic fish swam past out home on their way up the Thames. Maybe my recent meeting with Paul who was practicing his spey casting will at some stage in the future be common place to see a fly-fisher cast for a Thames salmon. Upon returning home it was time to clear up the shelves of the bookcase and replace a few books taken down for my trip, where to my surprise I found an old Abu-matic 170 which I had purchased a while back for my younger son to use. I guess the idea was to get him to fish with a closed face reel to avoid the mess he could get into with a bail arm spinning reel. 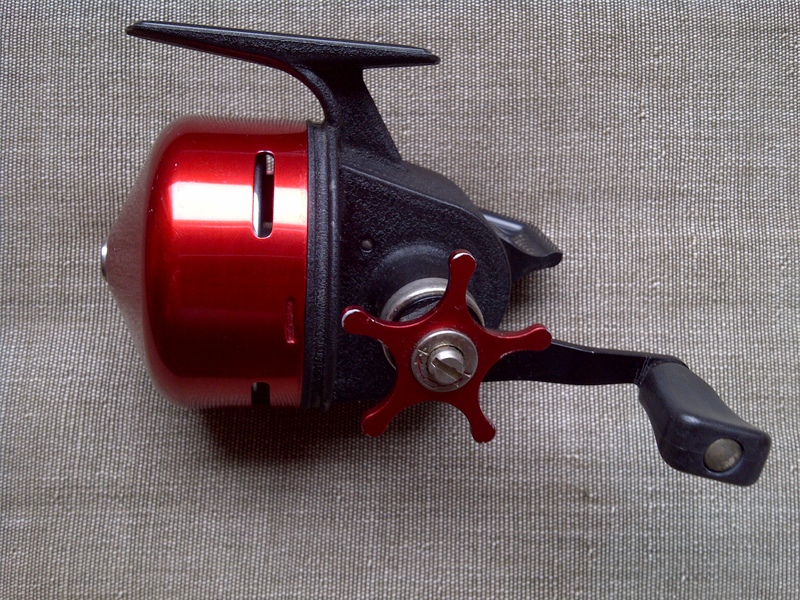 I have to say I was pleasantly surprised by his skill to manage a fixed spool reel first time out. 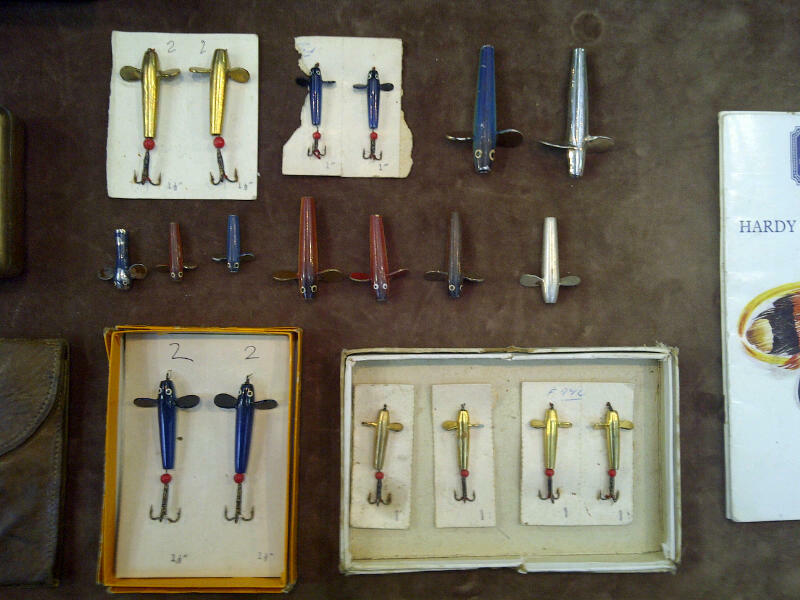 Vintage bait tin, Hardy’s rod bag, Abu Record Svangsta lure box and lures. Another bright but bitterly cold day. Work pressures mean that there was no fishing today nor was there time to take to the tow path for a walk. Yesterday I was lucky to be in North London near the River Lee so was able to take a brief stroll near Tottenham Marshes. The main river was frozen by the low temperatures overnight and only the lower stretch below the lock flowed by the lines of river boats with their chimneys smoking with coal and wood smoke. Over the winter months people have been clearing cupboards, lofts, sheds and garages, their contents displayed for sale at car boots, eBay and collectors fairs. 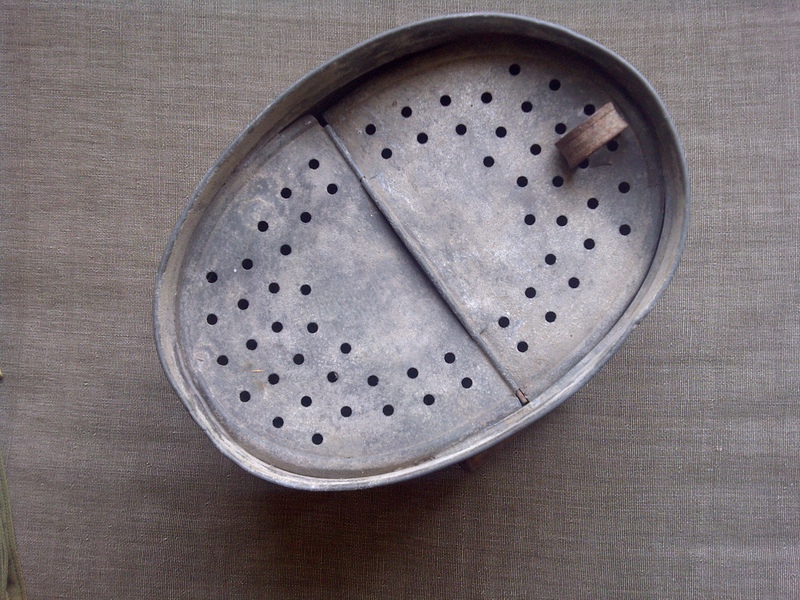 Recent finds include a zinc/tin bait keeper, a vintage Hardy’s rod bag and an Abu Record Svangsta lure box of mixed lures some Abu Atom,Abu Koster,Celta 1 and 6, Sussex No 3 and No 5. 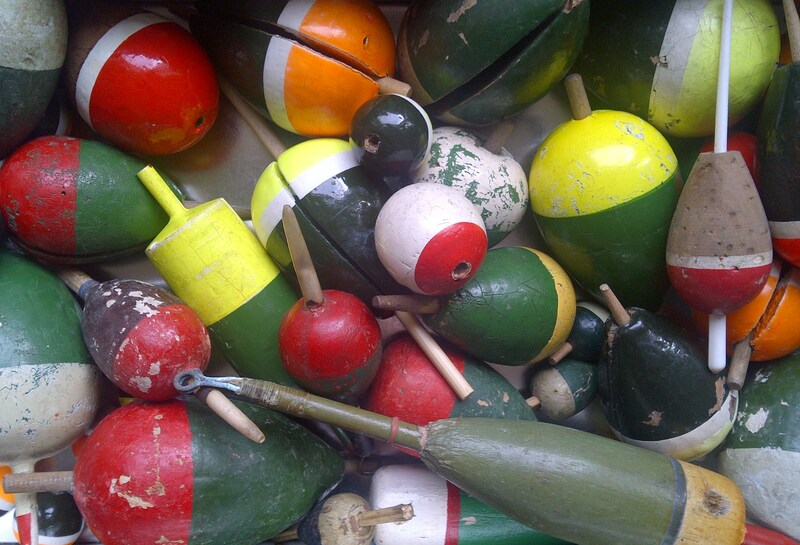 Other finds include a haul of 30 mixed floats, many with a tale to tell of tight lines and smiles. Eddie and I caught up over a late afternoon coffee and discussed a proposed visit to the Lower Itchen Fishery (see http://www.itchen-fishery.co.uk) for either a days coarse or Grayling fishing. 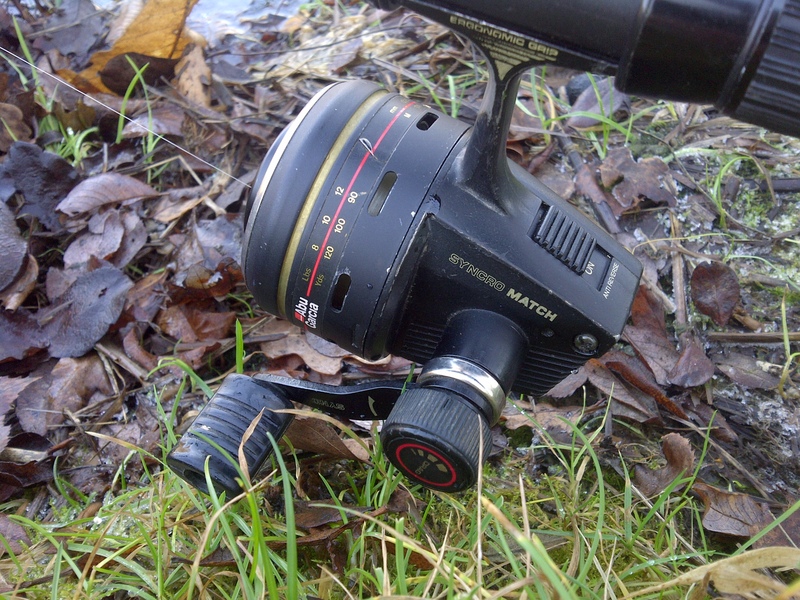 The lower beat renowned for good winter fishing is available daily at a price of £23.50 for coarse fishing or £40 per day for fishing the upper beat for Grayling. What inspired us was the thought of Pike on the fly. Maybe one of the haul of floats will find itself making its way along the Itchen in search of Esox Lucius. 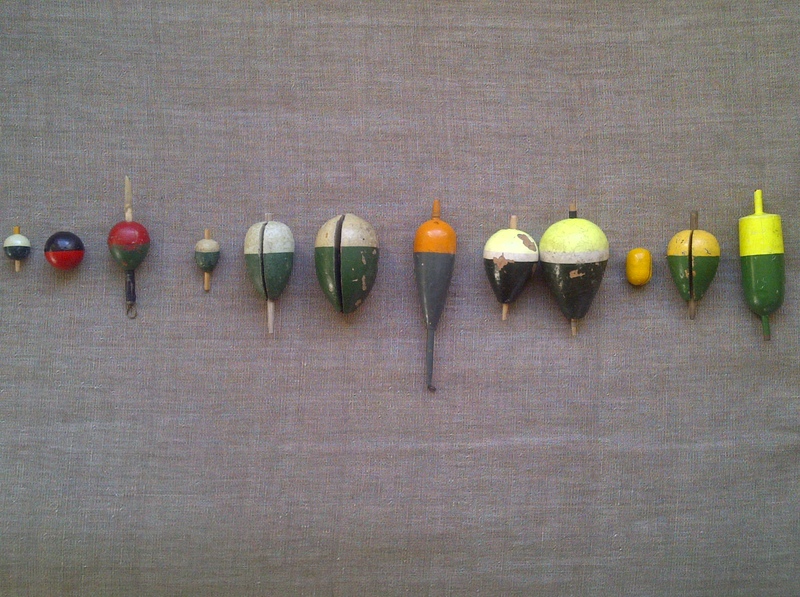 Found in a box at the back of the loft was this collection of old floats, a mix of Gazette style floats, some are Allcock but without the labels, these having worn off over the years, also few that I have purchased from car boots in Norfolk and a couple from John Andrews. I was woken by an eager son who remembered we had an early start to head towards Gravesend for a day’s fishing with a close friend Doug McIvor and his son. At 7am everything was covered in a heavy frost -4c in most of the surrounding counties of London as we made our way around around the M25 through Surrey and Kent. Fishing would be slow, with bright sun and low temperatures I knew fishing would be hard. We all met up in the car park at 10.30 as arranged, Doug dressed more like a Soviet spy but adorning his chest waders more for warmth than wading. 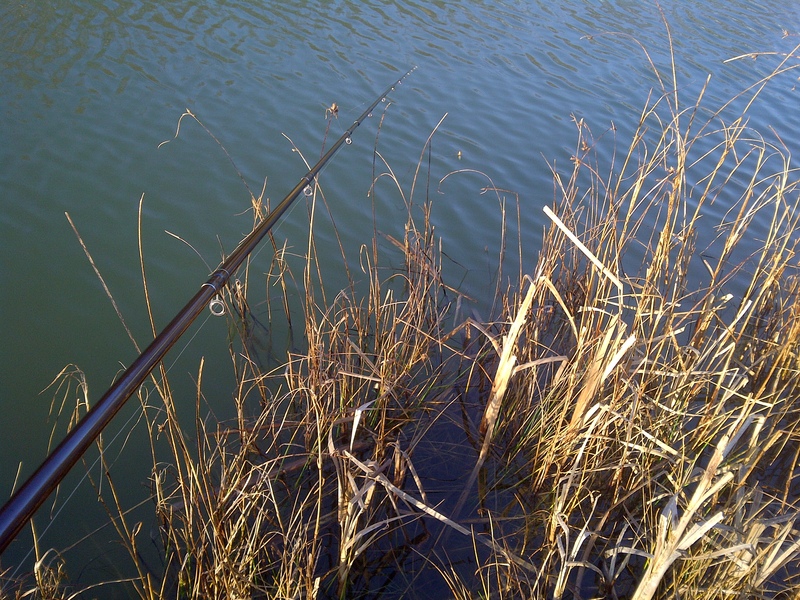 We set up on a peg close by to our fishing companions, checked the surroundings then proceeded to drown a few maggots. 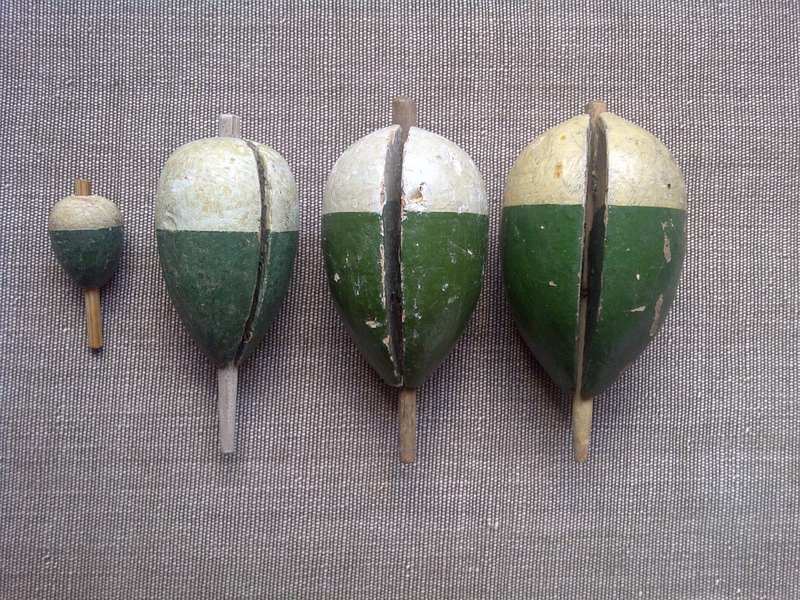 The floats that we cast gently drifted in the 1 knot wind without dipping for one moment. We changed bait to sweetcorn, then worms, then bread flake and still not a knock. I was using a Diawa Vertice Leger rod that I purchased off ebay and my trusted Abu 1044 with small stick float to a size 18 barbless hook with a single maggot. 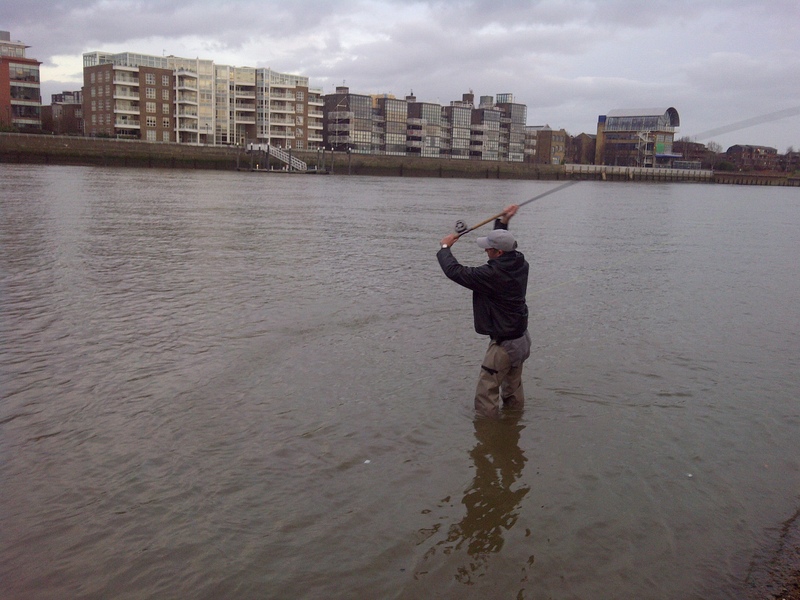 Having fished mid-water we tried the margins shortening the line between the float and hook but still not a knock. However the young lad fishing on the next peg caught a Carp on his third cast. We’d watched him set up then lob a bait ten feet short of the opposite bank within a few minutes he rushed to pick up his rod and strike into a fish. After a couple of hours we moved to new pegs and fished the margins near the reeds and then under some trees having baited it with a few maggots. It was a glorious day of full sun even though cold and the fact that we all blanked. Maybe a return visit this TWAP fishery will result in some tension in our lines. Early this morning we took to the river and decided to walk upstream and cross over at Chiswick Bridge and walk the path past Dukes Meadows and back over Barnes Bridge. 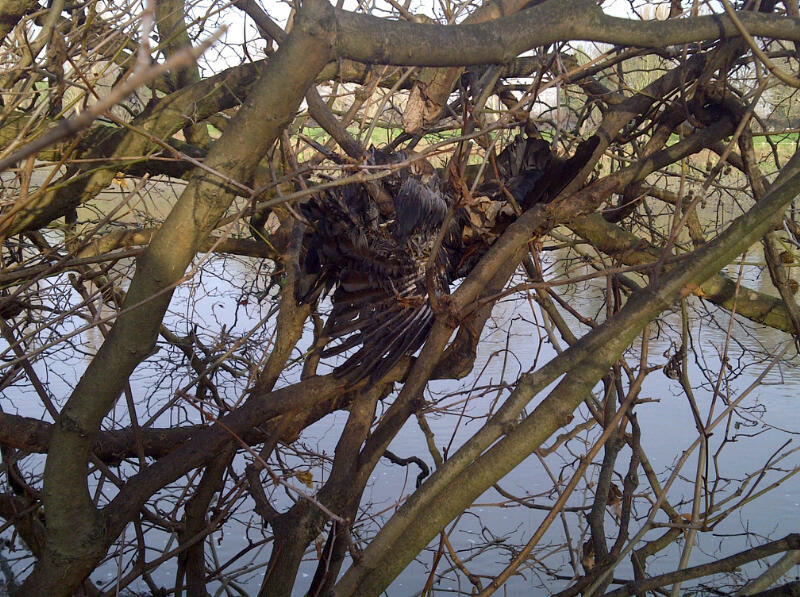 On the outward stretch past the Bulls Head one of London’s oldest Jazz venues and onwards past Ye Old White Hart and between the Stag Brewery I came across the carcass of a crow, suspended awkwardly in a tree. First thoughts where what fate this carrion of the skies had endured. I have been witness to magpies taking on these birds and on occasion seen the crows in battle with a resident kestrel. One thought was that there in front of me was a supply of crow quills for floats making and the second was to leave all alone. 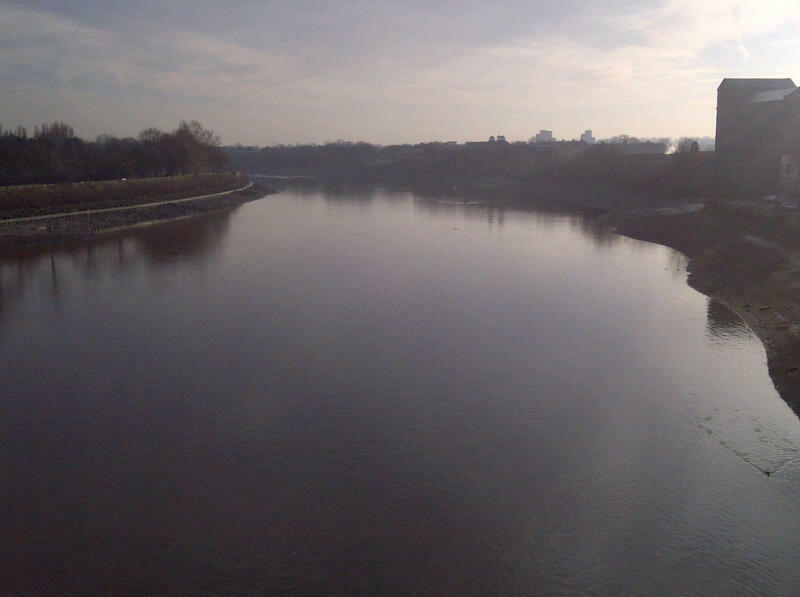 The river was on its way out on this cold January morning. We had seen the environment agency pulled up in their Land Rover and checked the river by Barnes Bridge, this is the first time I’ve seen them for months. At a weekend they would have found a couple of us fishing in these conditions but the river banks we free of fishermen today. I had work to do and I know Eddie was plying his trade in Sheen and our friend Brian was probably still tucked up under his duvet. The cold conditions are forecast for tomorrow which doesn’t bode well for a trip to Gravesend to fish Steps Lake or Long Lake at Shorn Country Park see http:www.twaps.co.uk/fishing-water/shorne/shorne-fishing-lakes.htm the water is managed by Thameside Works Angling & Preservation Society,TWAPS see http//:www.twaps.co.uk . I’ll report tomorrow on how we get on. A shoal of Devons found in Arcadia and a Pegley Davies catalogue. A brief visit to Spitalfields Market earlier today to drink tea with John Andrews and discuss his recent fishing trip to the Kennet resulted in the passing of an hour or so which flew by. A general chat about fishing and the meeting of a fellow fisher who discussed his recent fishing on the Lea and also purchased a cream and green bait box, clearly what was needed on a grey January day. Mr Andrews had a fine array of vintage fishing tackle, books and other printed matter that he had source from all corners of England. Several items caused debate, a large bait feeder by Efgeeco, a box of mixed floats one of which look as if it was made in a prevailing wind as the tip was bent in one direction and the efforts of a lady who wanted to purchase a fly wallet and use it for a cover for an iphone. There was also a splendid selection of Devons, a shoal of them better describes the sight, and a range of old pike gazette style bungs and some interesting pilots. Some of these have found their way to district 14 as Mr Andrews would say. The weekend looks promising for a spot of fishing with a friend who also has a great knowledge on Whisky as well as fishing, much to discuss I’m sure. By chance I had to head further West today and my journey took me through the villages of Chew Magna and Blagdon. These names are well known to me as when I was in my early teens I had a fishing companion called Mark Creevy, for a young lad he had a good cast on him, double hauling and would be down to the backing in no time at all. He and his father were keen fishers of Blagdon and if I recall correctly would sleep in the car overnight to start the first day of the season of this renowned trout water. 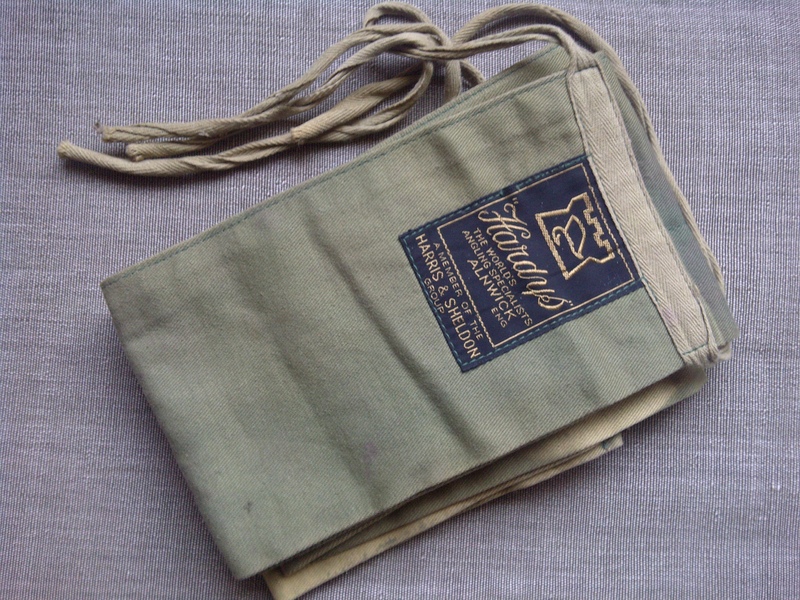 I recall stories of bag limits and large fish caught on Jersey Herd, Baby Doll, Daddy, Zulu and Deer Hair Sedge. Not forgetting other classics like GRHE, Pheasant Tail and in summer Buzzers. With a good thirty-five years since our paths crossed I wonder what ever happened to Mark but I wouldn’t be surprised to find him on the bank of Blagdon one day. Like many of my fishing friends we all hail from the path of the Thames, Mark use to live in Marlow and in later years I moved to Henley-on-Thames before moving downstream to Chiswick and now Barnes. It simply has to be the draw of the water that gets most of us, stream, loch, lake or sea there is always a community of fishermen, mixed origins, mixed ages and mixed backgrounds but one thing in common…fishing. It looks likely that I will have to visit this area several times this year so I will make sure a rod, reel and bag will accompany me on each journey on the off-chance that I may get a warm evening to cast a fly on these hallowed waters.